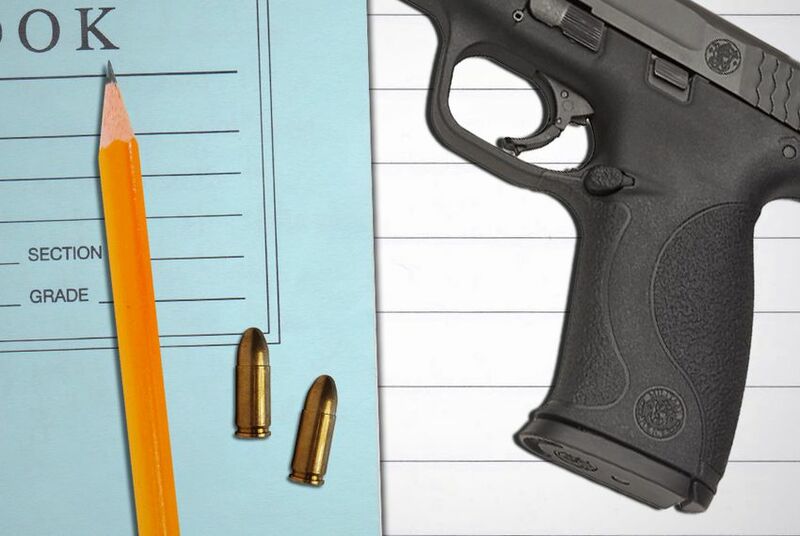 Facing a midnight deadline, the Texas House managed to pass a version of legislation allowing concealed handguns on university campuses that differs greatly from a version approved by the Senate. Thirty minutes before a key midnight deadline — and facing a potentially fatal procedural challenge — the Texas House hurriedly approved a bill requiring public universities to allow concealed handguns on campus Tuesday night. The 101-to-47 vote on Senate Bill 11 came after House Republicans added language exempting health facilities and letting universities carve out gun-free zones. They also adopted an amendment stating that private colleges would have to follow whatever public universities do. The version that passed the House, which still must take a final vote on the measure, is a significant departure from the legislation that passed the Senate. "Proud that campus carry passed the House before tonight's midnight deadline," tweeted bill supporter state Rep. Tan Parker, R-Flower Mound. The mandate including private universities might be enough to kill the legislation before final passage, said state Rep. Trey Martinez Fischer, D-San Antonio, an opponent of the measure. Under the version of the proposal that the House approved, all colleges and universities would be required to allow campus carry, he told reporters. "Tomorrow morning there are going to be a number of powerful people — maybe alumni, donors, board members — who are going to say we better get sensible, practical and realistic about our gun policies in the state of Texas," he said. Proponents of the measure argue that not allowing concealed handgun license holders to carry their firearms on campus infringes on the rights of law-abiding citizens — and, at worst, could leave them without a means to defend themselves during an attack. “If you’re in a heated debate with somebody in the middle of a classroom, and you don’t know whether or not that individual is carrying, how does that inhibit the interaction between students and faculty?” McRaven asked at a Texas Tribune event in February. By the time state Rep. Allen Fletcher, R-Houston, introduced the legislation on the floor, there were only two and a half hours left for lawmakers to consider the more than 100 amendments to the bill that had been filed. It appeared the clock would run out on the legislation as Democrats ate up time with procedural challenges and debate. With an hour left before midnight, Martinez Fischer brought a point of order against the bill. After spending 30 minutes discussing the matter, he withdrew his challenge. The chamber rapidly adopted two final amendments relating to private institutions and hospitals, and took a quick vote on the bill. State Rep. Sarah Davis, R-Houston, who had filed several amendments, said she agreed to pull them down after House leaders accepted her provision excluding health research facilities. Democrats also agreed to withdraw their amendments, she said. Lt. Gov. Dan Patrick, as well as the campus carry legislation’s author, state Sen. Brian Birdwell, R-Granbury, had both said in the days leading up to the debate the House had promised to approve the bill in time for it to become law. Proponents of the measure in both the House and Senate had discussed adding campus carry to another piece of gun legislation in an effort to squeeze the contentious measure through — but ultimately decided to move the bill separately to allow the House to have a full debate on the issue. Julián Aguilar and Alana Rocha contributed reporting to this story.